The constant hunt for valuable Google AdWords keywords is akin to Search Engine Optimization - a dark magic that can become very lucrative for those that can figure out how to best their competitors. It’s also very competitive, with companies bidding on keywords as they vie to outdo their rivals. Google has policies in place to protect companies from having their trademarked names abused in ads (for example, I couldn’t create an ad for Apple that linked to TechCrunch), but it isn’t perfect. Today we’ve gotten word of an example of what can go wrong with AdWords’ filters don’t work, and a Google employee may be behind it. Jeremy Schoemaker has built a name for himself as an online marketing guru at Shoemoney.com, where he writes on a variety of topics, mostly related to making money on the web. Outside of the marketing community he is perhaps best known for this famous photograph, in which he shows off a check displaying his monthly earnings from Google AdSense that total over $130,000. Unsurprisingly, other marketers have tried to build off Schoemaker’s success through dubious means, registering ads through Google’s AdSense program that use the word ‘Shoemoney’ in their text - a term that Schoemaker has trademarked. Google forbids the practice, and Schoemaker has been able to fend off violations in the past without going to court. But the latest offense was different. 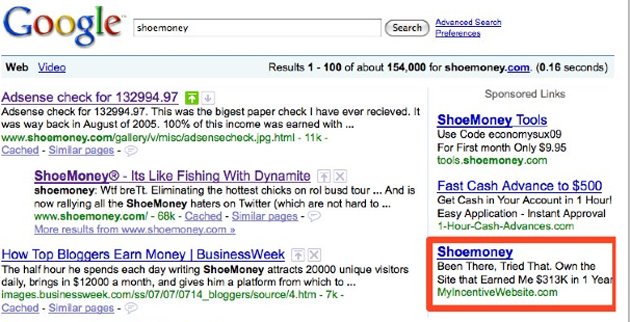 Beginning 4 months ago, Schoemaker began to notice a new violator, who was sending an ad for “Shoemoney” to the domain myincentivewebsite.com. Repeated attempts to contact Google and the offending parties went unanswered (as did a Cease and Desist). The owners of the offending website had set their contact information to ‘private’ through their registrar, so contacting them directly wasn’t easy. Schoemaker got a court ordered subpoena that ordered the violator’s webhost to disclose his personal information. With his real name in hand, Schoemaker finally managed to get in touch with the alleged violator. 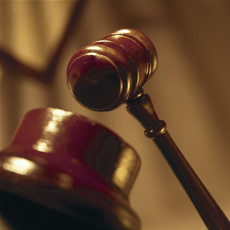 The defendant claimed to be unaware of any breaches of Google’s Terms of Service or the Shoemoney trademark. Schoemaker isn’t convinced, stating that “he played dumb every time and was very deceitful with his responses”. To make matters worse, the defendant attempted to clear his name by sending Schoemaker a screenshot of his account featuring a list of keywords he was targeting - a list that Schoemaker says was incredibly similar to his own. That’s when things started to get strange. A friend of Schoemaker’s discovered that the violator had a number of friends on Facebook who worked for Google’s AdWords. A cached version of his LinkedIn profile stated that he is an employee at Google working as an AdWords Account Strategist, though the title has since been removed. A call to Google’s New York office revealed that someone with his name is listed in the directory, all but confirming Schoemaker’s suspicions that he was dealing with a Google employee. Schoemaker has filed suit against the violator (and his father, who stepped forward to claim the offending website as his own). At this point it’s still unclear if the violator used his position at Google to bypass its trademarked words filters or to access Schoemaker’s own list of keywords, but at the very least it’s hard to believe the Google employee was unaware that his actions were in violation of Google’s Terms of Service.